It frightens me more than heights or roller coasters or swimming in the ocean — all of which are real, deep fears for me. I will never jump out of a plane or dangle from a bridge on a bungee chord, suspended above a rocky river. Nor will you ever see me riding Six Flags’ Goliath – I can’t even handle the ferris wheel. I am not adventurous in that way, and instead get my thrills from discovering simple things like a new cupcake shop. I realize that the basis of my fear is a little thing called death. But there’s a deeper layer rooted in the fear of surrendering all self-control and putting my trust in whoever is at the switch. There’s a “letting go” that needs to happen, and I am not a “letting go” kind of gal. With public speaking, you have to surrender yourself to the audience and hope that they will be engaged and kind and forgiving. It also requires being in the spotlight, something else I do not enjoy. I prefer to work behind-the-scenes. My earliest memory of this fear was in preschool. A few times a year, our teachers would make us perform a bunch of songs for all the parents. When it was showtime, I was the kid in the back row rubbing my eyes, crying. There’s a photo of me holding hands with another little girl with a Kool-Aid stained mouth, trying to comfort me. Situations like that overwhelmed me even at such a young age. When there’s too much stimuli, I shut down or meltdown. So then what would possess me to voluntarily get up on stage two weeks ago and tell a personal story, without notes, to a roomful of strangers? Fear. Or better yet, confronting my fear. This is me with Jeff, the creator of The Monti, after I performed my story. 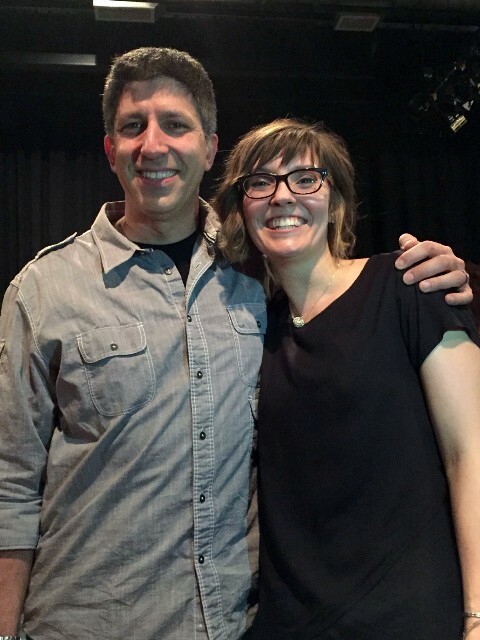 Jeff is an incredible storytelling coach and helped me craft my story every step of the way. He also believed in me, which helped me believe in me, too. For a few months, Jeff Polish had been trying to get me to tell a story at The Monti, a storytelling event where people from the community tell a true 12-minute story based on a particular theme. Jeff is the creator, and an all-around good guy. He also looks a lot like Ray Romano. Jeff launched The Monti in Chapel Hill in 2008 to a sold-out crowd, and occasionally he would bring The Monti to Greensboro. That’s how I became a Monti junkie. As a writer, I love a good story. But live storytelling, I discovered, offered a much deeper connection than words on a page. Every time I attended a Monti performance, my face would hurt from laughing and my eyes would burn from crying. Each story moved me in a different way. 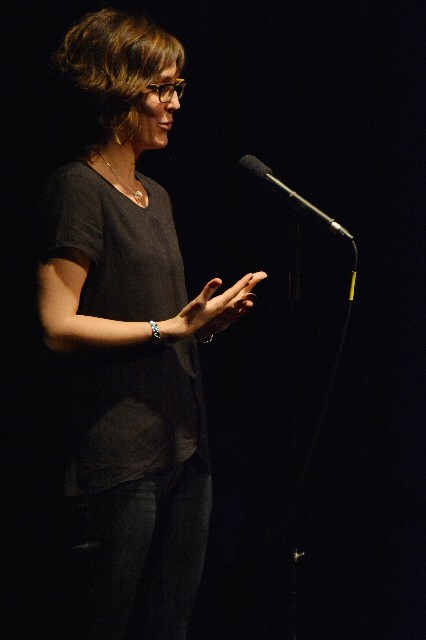 The night I walked away from my first Monti I thought, “I want to do this.” Followed by my second thought: “But I’m terrified.” For years, I attended The Monti as a spectator, trying to envision myself telling a story and thinking that over time I would muster the courage to step onto the stage. But fear paralyzed me. It took three invitations from Jeff before I finally said “yes.” The theme “Animal Instincts” spoke to me, but aside from that, I’m not sure why I finally agreed. In fact, it was almost like someone else had spoken “yes” for me. But once I committed, I knew there was no turning back. I was all in. And I was petrified. Someone told me recently that sometimes life throws challenges at us, stretches us beyond our comfort levels, to prepare us for something greater. I did not realize until now that in the months leading up to my Monti debut, I was tested in ways that I had never been tested before — and it all revolved around public speaking. Six months before The Monti, my aunt asked me to deliver the eulogy at my grandpa’s funeral. I cried so much throughout the funeral service that I worried I wouldn’t be able to pull myself together. My entire body trembled. But when I stepped up to the podium and looked out at the mournful faces gathered in the church, waiting to hear my words, the tears stopped, my voice was steady, and I just did it. How? I’m still not sure. Two months later, a colleague asked me to present at a conference. I was afraid, but I said yes. Two months after that, I had to give a group presentation to the president of the college I work for — and all the directors. Afterwards, people told me I was a natural and to walk in my gift. Me? I kept glancing over my shoulder, thinking they were talking to someone else. That’s me debuting my story on The Monti stage. It’s kind of surreal looking at these photos. I still can’t believe I got up there. Photo by McKenzie Floyd. The day of my Monti performance I felt like I was going to throw up. It started at noon, and only got worse the closer it got to showtime. Jeff assured me this was normal. In fact, when I saw him that night, he actually seemed proud that I had reached this critical point in the Monti storytelling journey. This is what’s supposed to happen. That night, I told a story, a love story about my first dog Yoshi — our beginning, our middle and our end. It was just me, and a mic and roomful of listeners. And it was the most vulnerable place I had ever stepped into. Willingly. But when I took the stage and I spoke my first line, all my fears evaporated. It was like someone flipped a switch inside of me, and it felt incredible. When I returned to my seat, Addison leaned over and told me to look around, “Everyone is crying. Not a dry eye,” she said. I scanned the faces in the room, wet with tears. In that moment, I experienced the power of storytelling. That night my words connected with the people in that room and they felt something. And I felt something too, an overwhelming amount of gratitude. I was grateful for an audience who was kind, attentive and open; for friends who cheered me on that night and surrounded me with support and comfort and lifted me up; and for Jeff for seeing something in me that I didn’t until now.